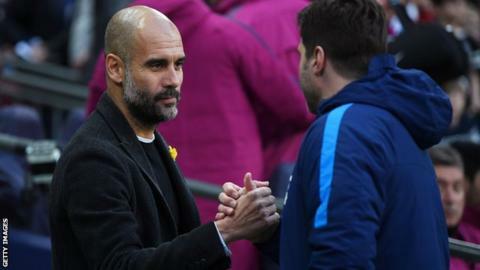 Manchester City manager Pep Guardiola says there is a five-horse race for the Premier League title after nine games. 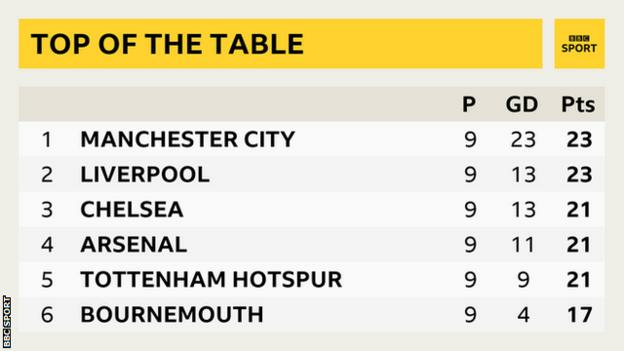 Defending champions City top the table, level on points with unbeaten Liverpool - with Chelsea, Arsenal and Monday's opponents Tottenham two points behind. When asked if it was a five-horse race for the title, Guardiola replied: "I don't have any doubt about that. The Spaniard added: "Last season we did really well in both games, but they are a top team." City travel to Wembley to play Tottenham the day after the stadium stages an NFL match between Jacksonville Jaguars and Philadelphia Eagles. "I am sure Tottenham have a good green keeper [groundsman]. Hopefully they can finish their stadium as quickly as possible, but it is what it is. It is not necessary to complain."